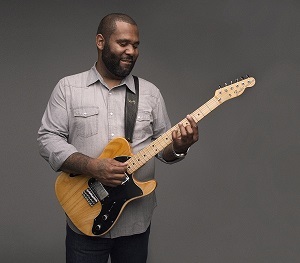 In 2004, Delta Groove Music put out the sophomore release, Shades of Blue, by an up and coming Los Angeles based guitarist, Kirk “Eli” Fletcher. Now, more than a decade later, the CD remains one of the label’s most consistent sellers. I thought it might be fun to look back to those heady times for the young guitarist and that recording. Shades of Blue and Kirk Fletcher are the subjects of this month’s ongoing feature, Re-Visited. Kirk Fletcher, a Los Angeles area native, was like most people of his generation, surrounded by hip-hop, rap and other forms of popular music which had very little connection to the blues. He had already been introduced to a variety of music at a young age by way of his older brother Walter. However, it was blues that captivated the young musician who had been playing guitar since he was eight years old. In 1997, Kirk Fletcher caught the ear of Big Al Blake. The singer and harmonica player for the legendary Hollywood Fats Band heard Fletcher playing at a small blues music festival which was taking place at California State University Los Angeles. Blake recognized the raw talent of Fletcher and heard a potential in his playing that he felt needed to be fulfilled. Blake introduced himself to the young musician and set out to further the education of a man who at the time was still a teenager. The educational journey continued for Fletcher. Then Watson introduced him to Lynwood Slim. Slim produced an album for Cannonball Records which came out in 1998 as part of the label’s Blues Across America series called The Los Angeles Scene. On the twelve track release, four artists are featured on three songs apiece. Joe Houston, Johnny Dyer and Finis Tasby along with the virtually unknown Kirk Fletcher appeared on the record. It was those three tracks by Fletcher that Lynwood Slim sent to his friend Jeff Scott Fleenor who was (is) on the staff of the Doheny Blues Festival. It was essentially a three song demo audition for that festival’s Talent Search Contest. Kirk Fletcher won the contest and was given a slot on the festival’s main stage. I was fortunate enough to hear the entire performance. It was one of the most memorable moments of my music listening life. Here was a young man who got it. He was not aspiring to be the next SRV ala Johnny Lang and Kenny Wayne Sheppard, who were “the next big thing” in those days. Fletcher was playing with that bright, reverb sound with the gusto and verve of his idol, the big daddio of the West Coast blues guitar, Hollywood Fats. I couldn’t believe what I was hearing. That afternoon was also the first time we met. He was humble yet affable at the same time. He understood what he was playing and why. I knew that I would be following his career and was anxious to hear his contributions to the lexicon. Even though I recognized that Kirk Fletcher was an immense talent, nothing could have prepared me for what was in store for the young musician. Within the next few years he would become the single most ubiquitous presence on the West Coast blues scene. Oh my, what glorious times they were. As it turned out, the turn of the millennium would represent the absolute apex of the blues revival. In Southern California there were a string of nightclubs that were putting up blues acts on their stages 5-7 nights a week. Fletcher would benefit greatly by being at the right place at the right time. That place was everywhere it seemed. He was playing in several of the best bands, backing the best musicians, and making a couple of records under his own name...all at the same time. In late 1999, Kirk Fletcher made his marvelous debut album under his own name, I’m Here and I’m Gone for JSP Records. 1999 would also be the year that he would become an in demand sideman as he appeared on Lynwood Slim’s album, World Wide Wood. In 2000, Kirk Fletcher called Al Blake on the phone. He told Blake he was looking for work and asked if he had any suggestions. So Blake called Kim Wilson knowing that Fletcher’s playing would be a perfect fit for the famous singer and harmonica player. He also knew that Wilson’s busy touring schedule would provide a steady income for any guitarist. Blake told me that he pulled out the stops and didn’t hold back his enthusiasm for Fletcher’s playing when pitching him to the famous band leader. A half hour later, Fletcher called Blake to tell him that he got the job with Kim Wilson. At the time Fletcher told me that he was thrilled, but really wanted the job with Kim’s other band, The Fabulous Thunderbird. That would have to wait. In the meantime a featured guitarist in Kim Wilson’s Blues Revue was a damn good, high profile gig. Fletcher played on Wilson’s Grammy nominated, Smokin’ Joint which was recorded live in 2000. In 2001, Blake re-assembled former members of The Hollywood Fats Band to make a record. The band included Fats Band alums drummer Richard Innes, Larry Taylor on bass and pianist Fred Kaplan. Fletcher was the logical choice to play guitar, so he signed on to the project, the results being the album entitled Dr. Blake’s Magic Soul Elixir. That record was so spectacular that Blake and company decided to reform the Fats Band with Fletcher on guitar. Out of respect and to honor the late guitar virtuoso, Hollywood Fats, they called themselves The Hollywood Blue Flames. They soon set out to make a new record. The self released album was called Est. A Long Time Ago. Now Fletcher was playing in two bands, Kim Wilson’s Blues Revue and The Hollywood Blues Flames, which both featured the world’s greatest blues rhythm section as Larry Taylor and Richard Innes were also in both bands. He was also picking up gigs with Lynwood Slim, Janiva Magness, James Harman and others along the way. He even played in Harman’s band along with young guitarist Nathan James at the prestigious Long Beach Blues Festival in 2001 and on Harman’s 2003 Lonesome Moon Trance album. Then he got tapped to play in Charlie Musselwhite’s band and it was off to the races with that high profile, national touring act. 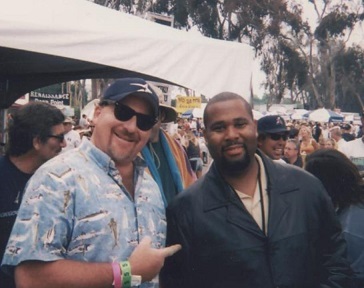 It was virtually impossible to go to a blues festival during this period and not hear the guitar of Kirk Fletcher. Chances were very good that he would be playing multiple times a day with a variety of artists. In the meantime, Los Angeles based harmonica player Randy Chortkoff had big plans of his own. He was producing albums with his company, Delta Groove Productions, and selling them to other record labels. 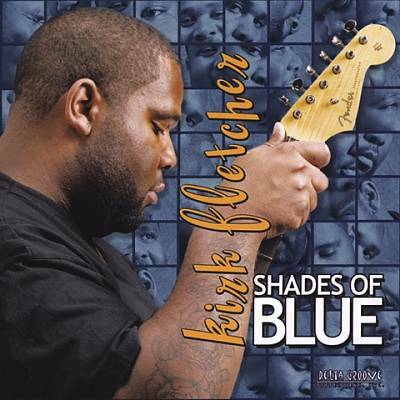 One of these was an album by Kirk Fletcher called Shades of Blue. It was recorded by Joe Bellamy at his Peace in the Valley studios in the Fernando Valley section of Los Angeles. Bellamy, who Al Blake calls “the man with the golden ears,” engineered and mixed the album. Fletcher knew Bellamy through working with him on Dr. Blake’s Magic Soul Elixir and Est. A Long Time Ago. The tracks were laid down in January of 2003 and released on Germany’s Cross-Cut Records. The core band for the project included drummer Richard Innes. Bass duties were shared by Ronnie James Weber and Jeff Turmes. Texan Red Young, who was living in Southern California at the time, was on organ and piano. Kim Wilson, Janiva Magness and Finis Tasby share vocal duties. Songs by Eddie Taylor, Magic Sam, Muddy Waters, Percy Mayfield and others are taken out for a spin. The right singers are paired with the right material. Fletcher stirs up a cocktail of musical influences on his guitar which services each song marvelously and his playing graciously compliments his musical guests. His solos are crisp, concise and yet exciting. He stretches out in places, but never over stays his welcome. The album opens with a Fletcher original instrumental entitled Blues For Boo Boo. It has a jazzy guitar/organ sound. He co-wrote another instrumental with Kim Wilson entitled Club Zanzibar. He even updated the Booker T. and the M.G.s classic, Hip Hug Her which features the great Red Young on organ. A year later Chortkoff decided to start his own label called Delta Groove Music. In November, 2004, the label put out its first two albums. They were the first album, That Represent Man by the newly formed super group, The Mannish Boys. That band, which included a long list of older, very well established, veteran blues musicians, also featured young Kirk Fletcher. Chortkoff also put out an updated version of Shades of Blue. It was licensed back from Cross Cut Records to the new label with three bonus tracks making the CD a hefty 17 song, 70 minute affair. In 2005, Jeff Scott Fleenor joined Delta Groove Music and his extensive background in the industry and overall knowledge of the blues genre made him what Randy Chortkoff called an “indispensible part of Delta Groove Music.” Fleenor went on to produce or co-produce with Chortkoff six more studio albums of the Mannish Boys all featuring the guitar of Kirk Fletcher. Fleenor produced other albums for the label while wearing about a half a dozen hats as well. Delta Groove also put out two more records of The Hollywood Blue Flames which featured the guitar of Fletcher. In 2010, the label released a second Kirk Fletcher album entitled My Turn. While the album has its moments, it is much less focused and not the overall satisfying listening experience that is Shades of Blue. By this time the blues business was in a sharp decline both artistically and financially. Fletcher, like so many other talented blues musicians, had to take work outside the blues field. In Fletcher’s case, he took a job playing with the popular, mainstream blues-rocker, Joe Bonamassa. The recently departed Randy Chortkoff left Delta Groove Music in the very capable hands of Jeff Scott Fleenor, who is now running the day to day operations of the label. Kirk’s fellow original Mannish Boys, Johnny Dyer and Finis Tasby passed away in 2014 as did Lynwood Slim who helped to set the ball rolling for Fletcher. The man who is widely considered the world’s greatest blues drummer, Richard Innes, passed away earlier this year, effectively ending the recording and live performance career of The Hollywood Blue Flames just as they were getting ready to go into the studio to cut another album. However, Al Blake is sitting on a treasure trove of unreleased live and studio recordings from those days of The Hollywood Blue Flames; many feature the guitar of the young wunderkind, Kirk “Eli” Fletcher. Blake is currently selecting and sequencing tracks. It is his intent to put this material out. While writing this piece this morning I got a call from Blake. As per usual we discussed many things of great import to our civilization, the cosmos and beyond. We also reminisced about those old days with young Kirk. We marveled at the rapid rise to the heights of the blues world and the various gigs where Kirk’s guitar playing was just jaw dropping. We talked about those yet to be released recordings which feature the guitar of young “Eli”.